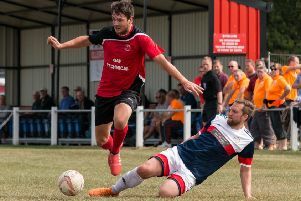 Despite one of their best performances of the Toolsport NCEL Division One season, Teversal were left disappointed after twice taking the lead but only coming home with a 2-2 draw from their tough trip to Yorkshire Amateur on Saturday. Never a happy hunting ground, Teversal looked to have made use of a red card to Ammers’ Glenn Wood as they led 2-1. But fine goalkeeping by Suwera Bojang and bad luck as they hit the post three times, saw the home side stay in the contest and level on 80 minutes , five minutes after Teversal youngster Kyle Hempshall was dismissed to even up the numbers. On the final whistle you could sense the Teversal Boys saw this as two points dropped not one gained. But the level of performance the visitors put in shouldn’t be lost in the disappointment of the result as it was up there with one of their best so far. Ammers were shocked by the visitors taking control of proceedings with a high tempo game that forced the home side into errors and giving up possession to the rampant Tevie Boys. After numerous efforts Teversal finally gained their reward on 10 minutes when Dickinson saw chaos in the penalty area as goal bound efforts were blocked followed by another effort until eventually Brett Watson applied the telling touch to give the visitors a deserved lead. Teversal, however, needed to remain switched on because every time they went forward they looked a threat with Craig Heard and Hughes menacing. The 15-minute mark saw a game-defining moment when Teversal’s impressive young centre half Kyle Hempshall received a yellow card for a mistimed challenge, something that would become significant later in the game. Two minutes later, though, Ammers’ Glen Wood shown his frustration with a rash challenge that could have been a yellow card on its own, but his dissent to the referee made it a very easy card for the referee to issue. The full back didn’t calm down and when Teversal went close with the free kick Wood ran straight into the face of the referee hurling verbal abuse at him as he felt he was impeded, but again the referee had no option but to award a second yellow followed by the mandatory red card. Luckily for Ammers they had a goalkeeper in Bojang who was in inspired form and effectively was two players as he adopted to the role of a sweeper keeper, clearing up anything that dropped in behind his defensive troops. Even when Kitchen played a superbly weighted ball to release Atkins, who broke clear from the Ammers’ defence, Bojang came off his line and remained big to make an impressive save going full length to his left. Teversal having not taken full advantage of their dominance, were always suspect to being hit on the counter attack. So when Blakely launched a ball behind the visitors’ defence with neither Gregory nor keeper Sheppard taking command, Joel Hughes seized on the uncertainty to nip in to nick the ball and round Sheppard to tap home the leveller two minutes from the break. It was the hosts who started the brighter in the early exchanges of the second period, but they failed to capitalise when Hughes broke clear to play an inviting ball across to Carl Heard, who failed to take the first touch that would have given him a clear run at goal. He miscontrolled, allowing Armstrong to intercept to dispel the danger. This then led to Teversal creating an opportunity where Dickinson tried to pull the ball back across the six yard box only for that man Bojang to spread himself to intercept the attempted cross. Teversal had now seized the initiative back with Kitchen, Dickenson and Guest combining to open up the hosts with the latter laying the ball across to the unmarked Coupe, who from 12 yards guided his effort past Bojang but hit the post. But a minute later on 59 minutes Coupe found Dickinson, who in turn played an inch-perfect ball to find the timely run of Kitchen, who calmly passed the ball past Bojang and into the bottom corner to restore the visitors’ deserved lead. Two minutes later it could have been three for the Tevie Boys with a little luck when Armstrong’s effort from distance was blocked, dropping to Dickinson who calmly placed his guided effort past Bojang. But again the post came to the keeper’s rescue. On 70 minutes the upright again rescued the Ammers when Atkins unleashed a free kick that beat the defensive wall and Bojang, only to be frustrated by the effort smashing against the frame again. On 75 minutes the significance of the Hempshall’s early yellow card was realised when the youngster naively got into a fracas with home sub Donaldson with both rightly receiving the yellow cards, and for the Tevie defender his red duly followed. Numerical equality appeared to give the hosts a boost and they had their best spell of the game which lead to an 80th minute equaliser, ironically scored by Donaldson. However, it was a goal worth the entry money alone with the sub picking the ball up with his back to goal just outside the 18 yard area to turn and curl an effort that dipped at pace into the top corner with Sheppard’s desperate efforts getting nowhere near. Credit to Teversal, they regained the initiative but unfortunately couldn’t find that elusive and deserved winner with their best of the efforts coming when they overplayed, trying to create the perfect opportunity when Guest in a good position decided to lay off to Atkins who fired high and wide of the target with the visitor’s last effort. Ammers, however, could have stolen it when Hull delivered a cross that Donaldson headed goalwards with Sheppard managing somehow to get the ball over the bar with an excellent unorthodox save. Next up for Teversal is a trip on Saturday when they visit Dronfield Town for a 3pm kick-off for the Toolstation Northern Counties East League Division One fixture. YORKSHIRE AMATEUR: Suwara Bojang, Robert Wadsworth, Glenn Wood, Thomas Rose, James Rothel, Matthew Thompson (Daniel Hull 74), Adam Shaw (Danny Carr 90), Harrison Blakely, Joel Hughes, Craig Heard (Jahsai Donaldson 60), Carl Heard. Subs not used: Luke Hammond. TEVERSAL – Dale Sheppard, Gary Armstrong, Blake Vincent, Jason Gregory, Kyle Hempshall, Brett Watson, Gary Atkins, Ashley Kitchen, Richard Guest, Sean Dickinson, Keiran Coupe (Brad Cox 66). Subs not used: Dean Short, Craig Charlesworth, Danny Tighe. REFEREE: Jamie Waters of West Yorkshire. TEVERSAL MAN OF MATCH: Sean Dickinson.